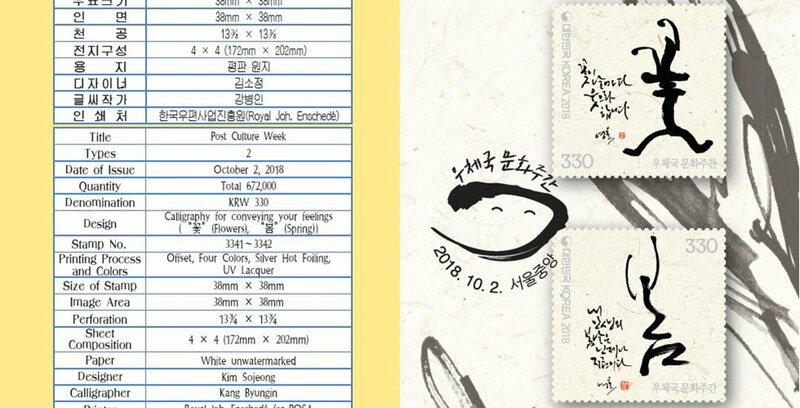 (News from 우정사업본부 / KoreaPost) On 2 October 2018 KoreaPost released two commemorative stamps for “Postal Culture Week”, promoting the idea of writing letters by hand instead of typing letters on a computer. For us, philatelists, this is especially important: the small number of letters being written these days means most children never see an envelope with real stamps on them. In addition to their original purpose, postage stamps have been used as a means of conveying one’s heart and mind for the last hundreds of years. 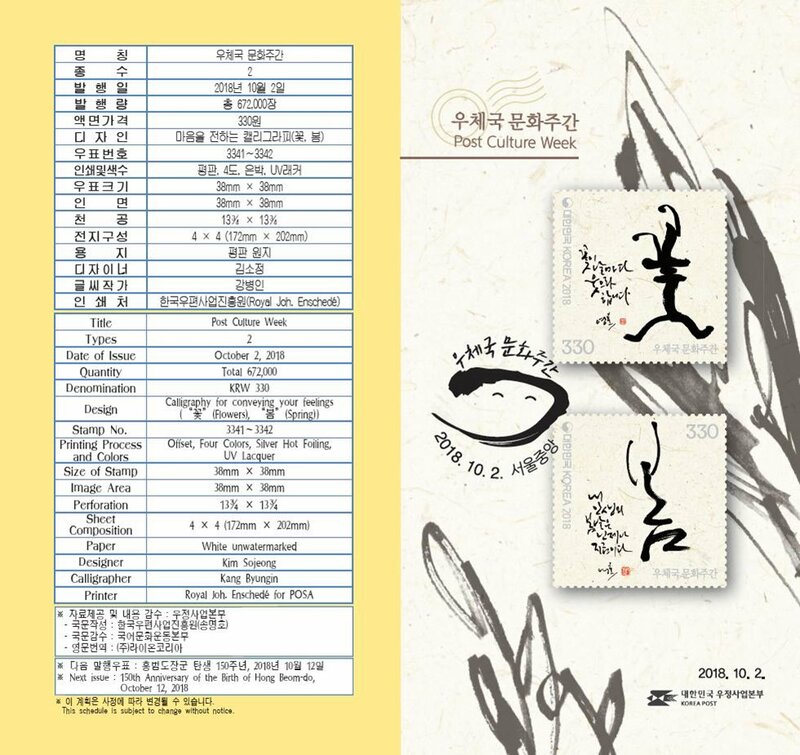 In celebration of the Postal Culture Week, the Korea Post has issued a series of postage stamps titled, Korean Calligraphy. Calligraphy refers to the art of writing letters beautifully by hand. 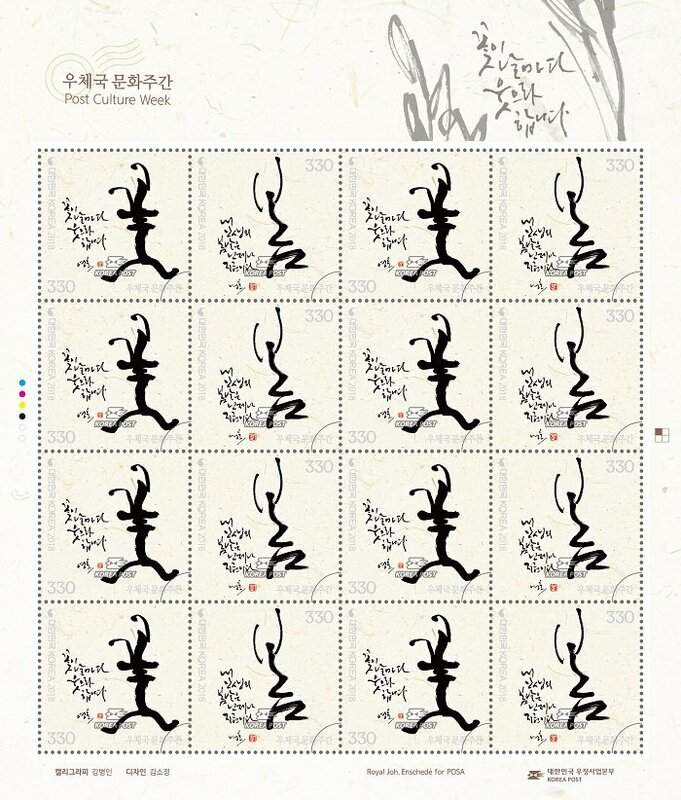 The latest commemorative stamps feature the outstanding works of calligrapher and artist, Kang Byungin, who dedicated himself to introducing the artistic value and beauty of Korean, combined with the appeal of calligraphy, integrating the art of calligraphy and design. 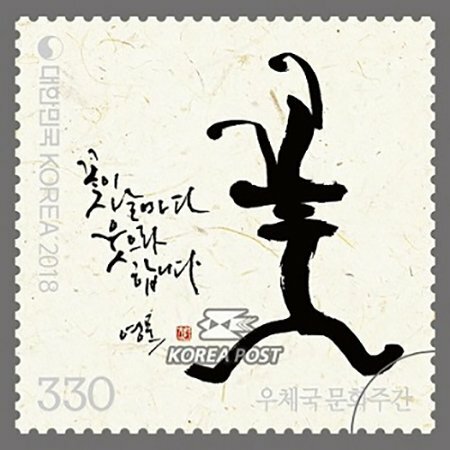 Through works that personified the words of 꽃(flowers) and 봄(spring) in Korean, the Kang conveys the warmth of the heart, which is the essence of postage stamps meant to be used for the purpose of sharing ones passion for life and happiness with others. Flowers make people smile. The Korean word for flowers, 꽃, conveys the feeling of happiness and beauty as flowers do. 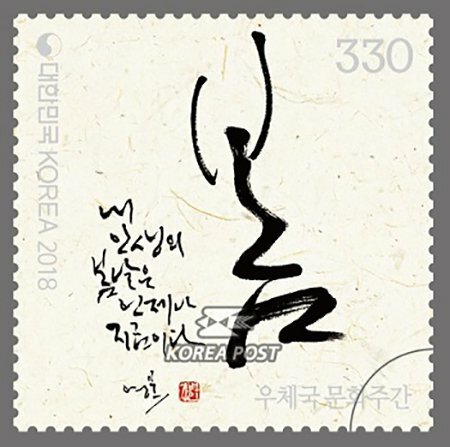 Kang depicted the Korean consonant, ㅊ, in the word, 꽃, as a human figure dancing dynamically just as Koreans have done so in harmony with nature. The word 봄 (spring) conveys the feeling of warmth and hope. No matter how long winter may last, spring is always around the corner, and our lives are very much the same in that spring comes to our lives however hard things may be. 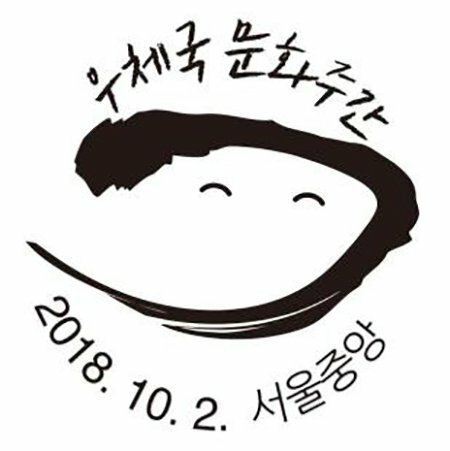 The calligrapher has depicted the word 봄 with the images of sprouts and flowers to convey the message that we have got nothing to fear so long as we believe that The Spring of My Life is Now. The calligraphic work instills us with the courage to be brave and the hope that we can change at any given moment. As the Internet and digital devices grow in popularity, fewer people bother to write letters by hand, let alone select postage stamps to convey their personal feelings. However, no one can deny the fact there is no replacement for the pleasure of writing out letters in earnest and reading them one by one, savoring the feelings embedded within the handwriting. 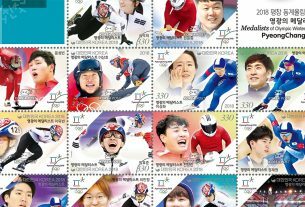 Korea Post hopes that the commemorative stamps issued for this Postal Culture Week will enrich everyone’s lives happiness of the days of old. KSS chairman and webmaster. 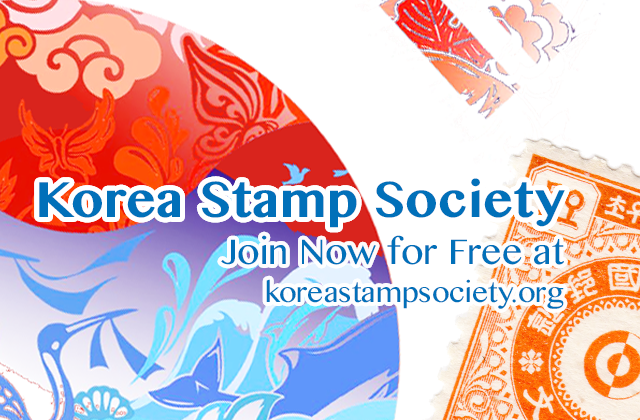 I collect Korean revenue stamps. Currently living in Amsterdam. 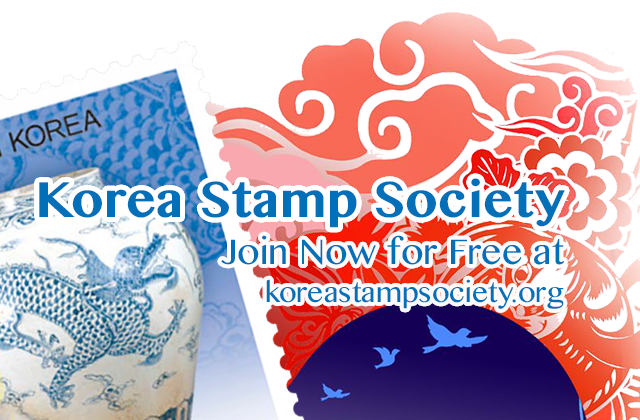 Reader’s Question: Pre-stamp mail between Korea and USA? 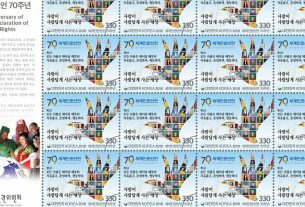 Too early day of issue of DPRK stamps? 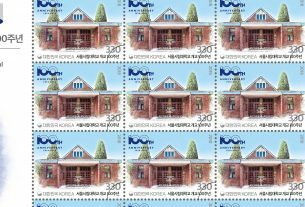 1959 “Peaceful Reunification of Korea” stamps: real, fake, or a reprint? Ask a question to the KSS!